The New Richmond Newspaper recently wrote a great article about the Wisconsin champions Dale Hjelmgren and Justin Lamb. Both players are from the Outer Limits in New Richmond and respectively took 1st and 2nd at the Wisconsin championship. Both Dale and Justin will be competing with 48 other players with the top 21 winning seats into this years WSOP. The Regional Championship Tournament is almost here! One lucky winner will win airfare and hotel to Las Vegas to compete in the National Championship. At the National Championship we will be awarding 8 seats into a World Poker Tour Event and also 1 bonus World Series of Poker seat. Pitcher’s Pub in Madison, WI has joined the Free Poker Network. They have come aboard starting with the “Ship It!” promotion. They play on Monday nights at 7:00 and have a fabulous venue for poker. On June 29th at the Orleans Casino in fabulous Las Vegas Michael Grote from the Underground Saloon in Hartford joined 24 other players from all over the country that had flown in for there shot at the coveted World Series of Poker main event seat worth $10,000. 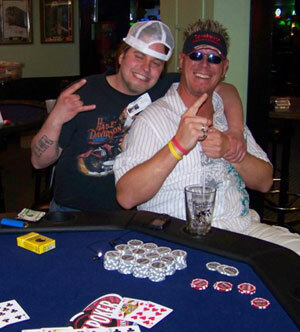 Michael had already won $2,500 for travel expenses and a $1,500 seat into event number 52 at the World Series of Poker. Michael came very close to turning that $2,500 into $12,500 by almost taking down the National Championship. He ended up making the final table and was running good until there was a blind vs. blind. Michael hit an opened straight draw and a flush draw vs. Clay Lipke (Breezy Point, MN) who flopped two pair. Unfortunately for Michael he was unable to catch back up as Clay crippled him and eventually knocked Michael out. But his chips did go a long way as Clay ended up winning the tournament. Michael was very fun to hang around with and got to know the FPN crew very well. He even helped us do some reporting on the WSOP event number 52, thanks Mike! Click here for all the details and trip reports.